Sleeping bags just aren’t enough sometimes when it comes to camping outdoors, especially in cold weather. From pebbles, sticks, pinecones, tree roots, and surfaces that are jagged and uneven, you need some cushion beneath you. Luckily, camping and backpacking companies have come up with a solution to this problem. Light, durable, and inflatable sleeping pads work just like your mattress at home. Except, you can roll it up and carry it with you wherever you go. For every sleeping pad purchased, they’ll plant a tree! Unlike a sleeping bag, pads aren’t meant to be large or bulky, most fit into small compression sacks that aren’t much bigger than a water bottle. Most sleeping pads come with an R-value, which is just a measurement of the quality of insulation, or the ability to hold heat. If you’re going out into real wilderness, make sure your sleeping pad has an R-value that will keep your warm through the night; 9.5 is the highest rating on the insulation scale. For summer nights, go with an R-value between 2.0 and 4.0 so you don’t get too hot. While a high R-value is great for cold weather, you shouldn’t depend on the sleeping pad alone to keep you warm. Always bring extra clothing and blankets if you plan to sleep in extreme temperatures. TNH Outdoors has designed the perfect sleeping pad that works well for both men and women. At 1.5 inches thick, you can lie down and feel like you’re on your mattress from home, rather than on top of rocks, dirt mounds, and other uneven surfaces. 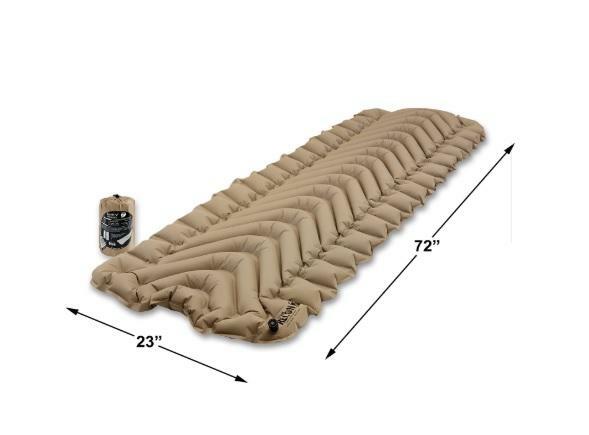 This sleeping pad includes a 500 series valve for easy inflation and is narrow like a mummy bag. Just give it a couple of good blows and you’re all set up for sleeping. The 75D Polyester skin will keep you dry, and it’s water resistant so it won’t soak up any rainwater or moisture. 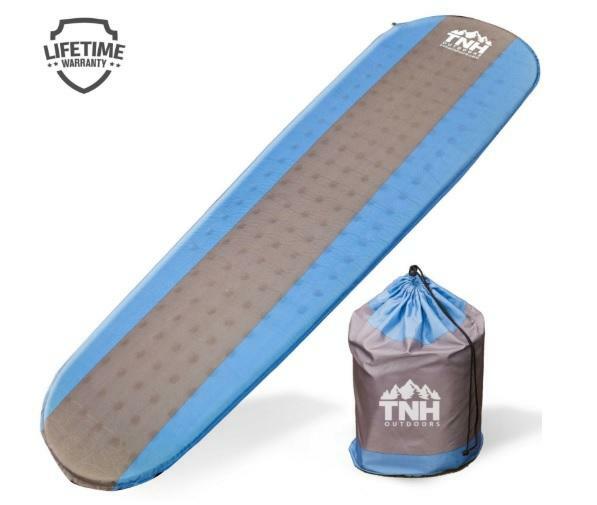 This pad even works for people who are over 5’9, so if you’re a bit taller than the average person the TNH Outdoors sleeping pad will be your best friend. Is not self-inflating, has to be blown up manually which can be inconvenient and time consuming depending on the individual. Unroll this sleeping pad completely and allow it to lie flat before you try blowing it up. This way, you won’t risk over-inflating it or making holes. Some of the problems people have had with cells bursting could be related to improper inflation. If you’re uncertain of how to correctly inflate your pad, it luckily comes with both written and photo instructions to further assist you. Inflatable pads aren’t for everyone as they are a bit softer, if you’d rather have a firmer sleeping pad that you don’t have to inflate, try a foam pad instead. Outdoorsman Lab has provided us with a 2 inch thick sleeping pad that comes in green, orange, and blue! The compact pad has a grid pattern designed to keep cells from splitting up and becoming one giant lump, and sizes down to 8 inches by 3 inches by 3 inches when rolled up. Each cell has limited airflow to keep your from losing warmth, and to prevent leakage, while still being light and easy to carry. Made with weatherproof, 20D woven nylon rip-stop material you can sleep through the stormiest of nights without dealing with a soggy sleeping pad in the morning. The lifetime warranty ensures that no matter how long you own this pad, you can get a new one if anything is wrong with your current one! Although it is a blow-up item, you can easily compare the comfort of the Outdoorsman Lab pad to that of a foam design, without the added weight. If you get your Outdoorsman Lab sleeping pad and it feels a little stiff at first, it might just be that it needs to stretch. Give this product a test run and blow it up over night before you head out on your trip to the wilderness. Don’t forget to use the awesome packing bag that comes with it, you can easily shrink this pad down to a water bottle size and carry it with you anywhere! The V-shaped Klymit Static was created to keep your “mattress” pad from moving around beneath you while you shift positions in your sleep. From red, orange, blue, green, and other hammock styles, the Klymit brand has a sleeping pad for everyone! The stuff sack that comes included will ensure that this product can be tightly placed in a bag without taking up extra space and getting in your way. The 75D polyester is incredibly strong and won’t give in to pressure or puncture when placed against rocks or jagged edges. In the event that it does, you can use the patch kit that comes with this sleeping pad for an extra tight seal. Since there isn’t a weight limit, this product can be used by just about anyone. At about 300 pounds, you might see some uneven distribution. Nonetheless, it’ll still work perfectly fine for those of a larger stature. Make sure that you tighten the air valve completely, and consider adding extra coverage or patching around it to prevent air leakage. If you do happen to receive a defective one don’t throw it away, take advantage of the lifetime warranty and send it back to the company for a brand new one. 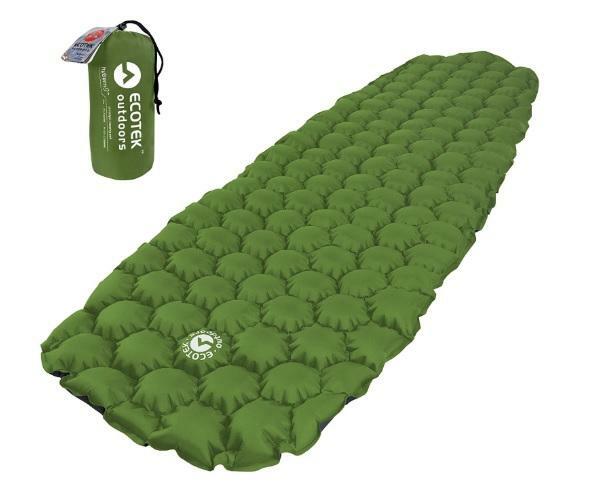 Much like the Outdoorsman Lab sleeping pad, the EcoTek Outdoors HyberN8 has a hexagonal grid pattern for better insulation and air-locking to prevent leaks. The 70D polyester prevents tearing and holes from sticks and stones that might be lurking around. It also happens to be quieter, and more comfortable to sleep on than other material. EcotTek is a very unique company, they’ve made a commitment to donate some of their profits to National Forest Foundation. In addition to light weight, well designed sleeping bag, you’ll have the satisfaction of knowing you helping the planet! You can even place this pad inside of your sleeping bag if you want to keep it clean, the only downside is that it probably won’t fit inside a mummy bag. However, you can still keep it in your tent and place it underneath you. Currently, the HyberN8 is going through an evaluation to determine the R-value of this sleeping pad; as of right now it is estimated to be somewhere between 1.8 and 2.3. Check back on the website every few weeks or so to see updates! Unlike the pads listed above, Stoik’d has created a pad that is both inflatable and includes a thick foam padding. This is perfect for anyone who wakes up with sore muscles and a stiff back after sleeping on a blow up mattress. This sleeping pad is completely flat, there are no grid patterns or uneven areas that move while you’re sleeping or cause discomfort when lying on your side. The added survival blanket will provide you with extra warmth, in case you forget yours at home or just need a second one for the evening. This sleeping pad is built for emergency situations, so if you think there’s any chance you might find yourself in a pickle while roaming outdoors, bring it with you. The Stoik’d company is all about customer satisfaction; not only can you exchange this sleeping pad, you can return it for a full refund. Not that you won’t enjoy using it, but the best products are usually backed by excellent return policies. 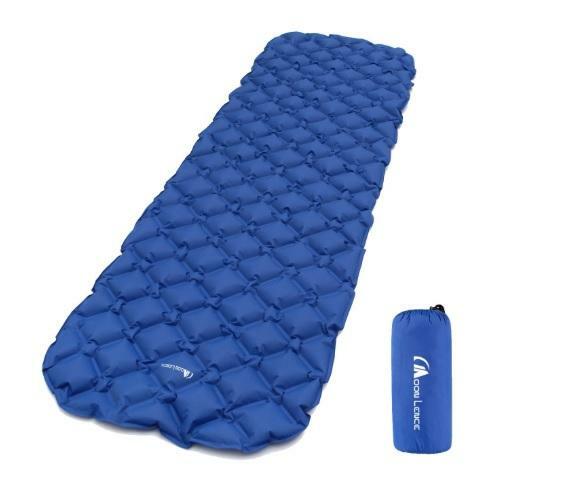 Available in blue, green, and orange, the Moon Lence sleeping pad is different from most because of its two-way valve. The light rip-stop 20D nylon material is extremely light and has an R-value of 1.3. It has rip-stop capabilities and is designed to be leak proof and waterproof. This sleeping pad takes about 10 breaths, about 5 less than the average to fully inflate which is a plus if you’re someone with a smaller set of lungs. The Moon Lence is overall easy to inflate, light, small, and easy to carry with you. If you find something wrong or defective with this sleeping pad, return it for your money back within 30 days or exchange it for a new one at any time. The Lifetime warranty will ensure that you get full use out of this product, and never have to buy another one. 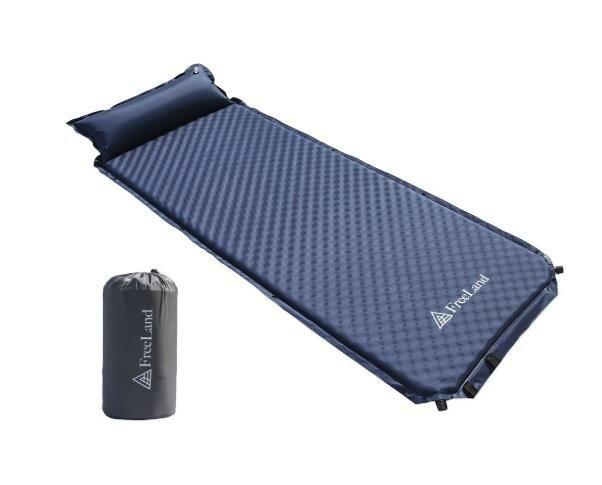 Freeland not only offers this sleeping pad in navy, light blue, and teal, but this pad in particular comes with its own built in pillow! The 190T polyester pongee fabric will keep your body insulated and holds up against wear and tear from transporting and frequent use. If you’re the kind of person who can’t sleep on the grid patterned pads, you’ll be very happy to know that this one is completely flat. 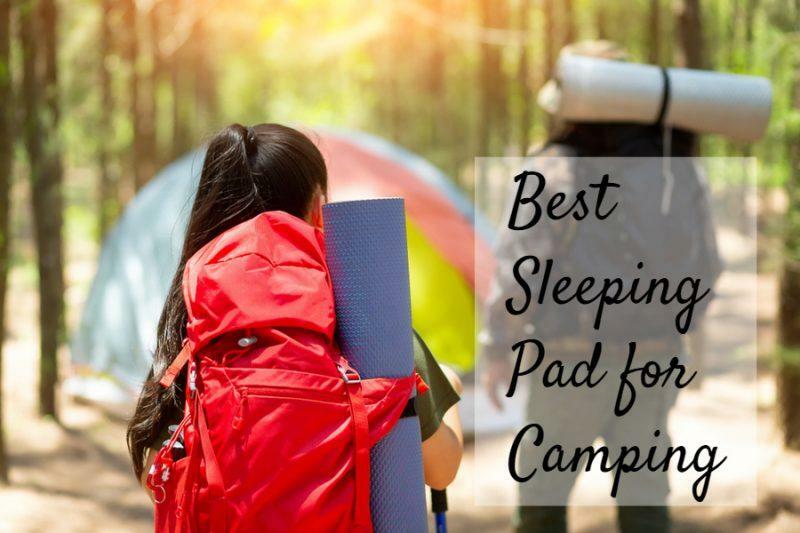 The best part is this pad can be conjoined with others if you’re camping with your significant other or your kids; when sleeping in the cold, extra body heat is always helpful. The Freeland sleeping pad also goes through 72 hours of testing before being sold to customers, this prevents defective items from hitting the shelves. To avoid air leakage and holes, lie the pad flat the first time you use it and allow it to completely self-inflate before attempting to blow it up the rest of the way. Most self-inflating sleeping pads will need a test run for the first use. You don’t want to get it out into the woods before finding out it doesn’t work or before learning how to use it properly. If you have a bad back and need extra cushion, this sleeping pad may not be right for you, due to how thin it is. Otherwise, it’s lightweight and easy to pack up and carry with you on your journey. This thick, durable pad is perfect for camping with your buddies and family thanks to the snap buttons on the sides. 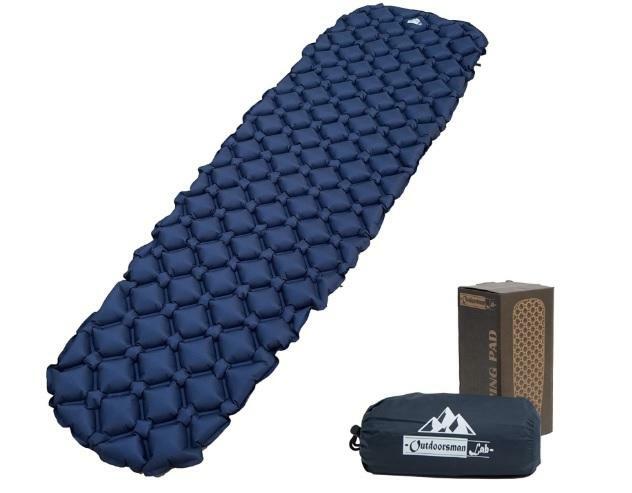 You can easily connect this sleeping pad to another for a bigger mat and more room to lie down. 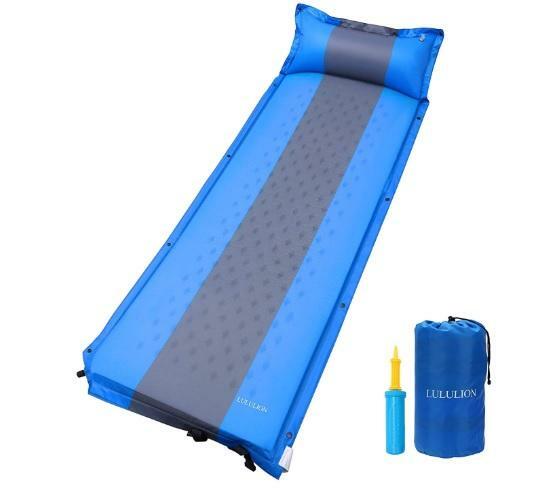 Made from 190T polyester material, the Luluion is waterproof, mold, and mildew resistant. The valves on this camping mattress allow it to blow up on its own completely, you should never have to assist expansion with your own breath unlike the others. The Lululion is a high quality sleeping pad made for families and friends who love travelling together! Pillow attachments are common on sleeping bags, but a rare find on the pads, so the Lululion is definitely a bonus. In contrast to the name, the Koolsen is actually very warm and has an R-value of 4, so you can use it during the fall and the earlier part of the winter season. The 75D polyester fabric has TPU lamination and it is both water proof and tear proof. This pad is multi-use, you can use it for backyard camping in the bed of trucks, put it in your hammock, or keep it on your futon so your guests can have a warm, comfortable evening. You’ll also be happy to know that the brand strives to be environmentally friendly and participates in a “plant a tree” program! So you know you’ll be doing a good deed by purchasing this sleeping pad. 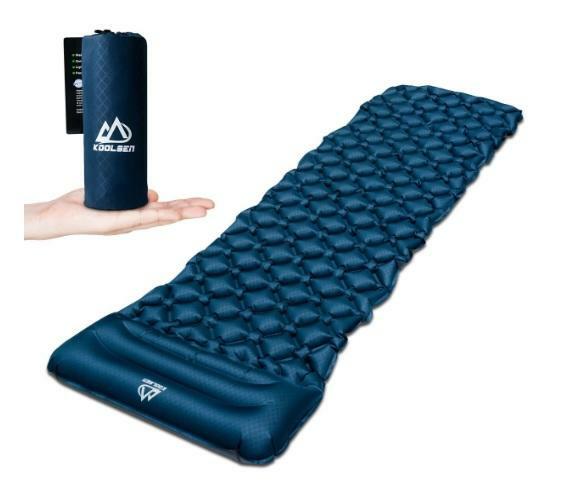 The Koolsen brand offers returns and exchanges if you are at all unsatisfied with your purchase; however I think you’ll enjoy this sleeping pad. With an R-value of 4 you’ll have a nice, warm evening around the campfire. Since it is smaller than what most have expected, the upside is that you know for sure you’ll be able to carry it easily. 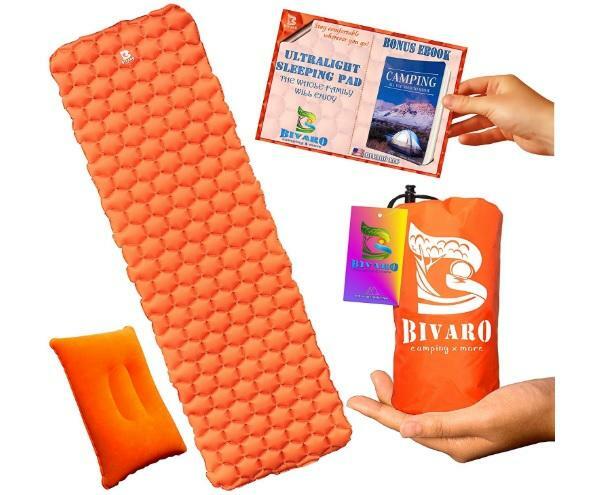 Last but not least, the Bivaro sleeping pad is one of a kind. While it does have a grid pattern, the Bivaro lies completely flat and provides plenty of support for your back and hips. The bright orange color works well in situations where you find yourself lost or in need of assistance, you’ll be easy to find among a lush green forest or a white blanket of snow. It does include a pillow, but as opposed to the other items listed, it’s not attached so that you can remove it if you find it to be uncomfortable or would rather use your own. The Bivaro is light, and compacts all the way down to a water bottle size! If you aren’t sure how to roll it up, just check out the instructional booklet included with your purchase, it’ll tell you everything you need to know on how to use this sleeping pad properly. Could be considered both a pro and a con, this sleeping pad is quite large, so it’s good for taller people. However, it may not fit inside a tent. Open this sleeping pad completely before you blow it up to maximize empty space and to prevent it from popping or leaking air. The Bivaro has an R-value of 1.3, so it is best to use it during summer weather and should not be relied upon for warmth in the winter. 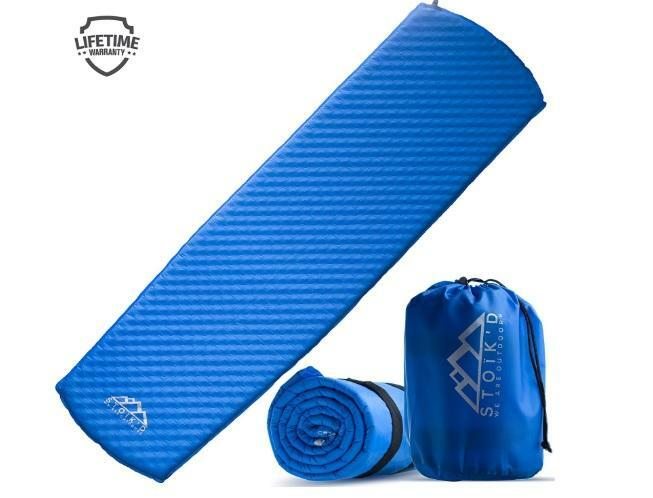 There are 2 patch kits included with this sleeping pad, so bring them with you whenever you go for a hike or overnight trip, it’ll save you from sleeping on the ground in the event that your pad is punctured or begins to leak. If you’re feeling a little overwhelmed, not to worry! Looking for a sleeping pad shouldn’t be a stressful situation; the idea is simply to keep you more comfortable while you’re out on the road. No matter what season it is, look for the pad with the highest R-value possible. The products listed above generally have an R-value of 4 or below, they’re meant for fall and early winter in an average climate. For climbing mountains, and extreme cold, you’ll definitely need to look for a pad with a value of 7 or more. Although they can be incredibly helpful, you should not rely on any sleeping pad for warmth. Make sure that you have a thick, insulated sleeping bag, preferably one that has room to place your pad inside and zip it up with you while you sleep. No matter how great your sleeping pad is, no matter how long it has lasted, always bring a patch kit with you just in case. Accidents are bound to happen, and they usually occur when you aren’t prepared for them. So if your pad doesn’t include a kit, make sure you get one and keep it with you at all times while you’re camping!